If you're looking for a healthier recipe for cookies that makes not to sweet treats - look no further. These Toasted Sesame Cookies may be just what want. Each cookie, as made according to this recipe, has 70 calories and only 3 grams of fat. When I think of sesame seeds, I associate them with bagels, bread or crackers where they lend a slightly nutty flavor. Given the seeds popularity in baking, it's no surprise that they'd show up in a cookie recipe. Sesame seeds grow in pods on flowering plants and can be found in many different colors from lighty creamy off-white to black. These days sesame oil is just as popular in cooking as the sesame seed, which is popular in many Asian dishes and baked goods. The seeds are also used to produce tahini which is a key ingredient in the popular Middle Easter spread and dip, hummus. Typically, sesame seeds contain helpful antioxidants and are great sources of iron, copper, magnesium and calcium. 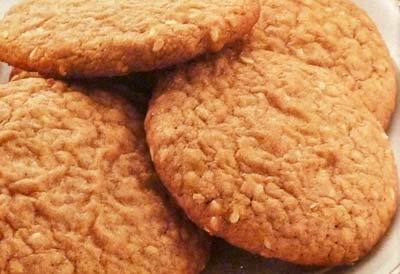 Ready to try this "not too sweet" recipe for sesame seed cookies? Spread sesame seeds in shallow baking pan with sides and toast at 350F degrees for 15 to 20 minutes or until light golden brown, stirring occasionally. In a small bowl, stir together flour, baking soda and salt; set aside. In a medium saucepan, melt butter; remove from heat. In a mixing bowl, add brown sugar to melted butter and blend well. Gradually add dry flour mixture and mix well. Cover cookie dough with plastic wrap and refrigerate at least one hour for easier handling. When you're ready to bake cookies, make sure oven is preheated to 350F degrees and line cookie sheets with parchment paper or lightly grease and set aside. Form dough into 1-inch balls and place about 2 inches apart on prepared cookie sheet; flatten dough balls slightly with bottom of a glass dipped in sugar. Bake for 8 to 10 minutes, or until edges are light golden brown. Remove from the oven and immediately transfer cookies to wire racks to cool completely.